Want to learn more about Kevin? See his stats and biography? Click here for Information on Kevin Harvick! 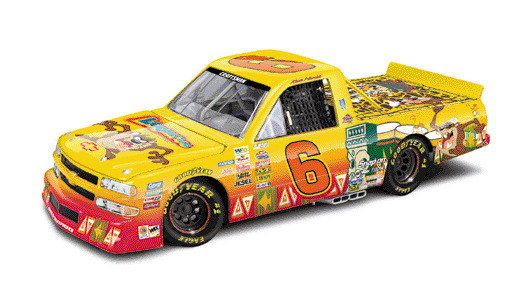 On November 8, Kevin Harvick drove his #6 Chevy Truck into Victory Lane at Phoenix International Raceway. 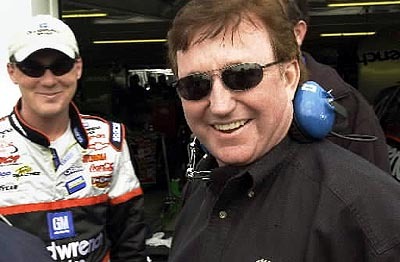 With his first truck victory, Kevin joined Mark Martin, Terry Labonte, Bobby Hamilton and Ken Schrader as the only drivers to win a race in the Winston Cup, Busch and Craftsman Truck Series. Snap-on and RCR commemorating partnership throughout 2003� Snap-on is celebrating 10 years of partnership with RCR through a special "Decade of Dedication" initiative that features the special-edition #29 car raced in 2003's "The Winston" and a host of new racing-themed tool and equipment products. Strange But True Throughout the history of stock car racing there have been some incidents so bizarre that no self respecting Hollywood screenwriter would dare to include them in a movie script. All the following incidents actually happened.. believe it or don't. Tim Flock had a rather unusual passenger aboard his Hudson race car during much of the 1953 season. Jocko Flocko was a small monkey who had his own driving suit, and sat in a specially prepared seat complete with a safety harness. During the Raleigh 300 at the Raleigh Speedway, May 30th, 1953, Jocko got free of his harness and began leaping about inside the car. In those days race cars had a small trap door the driver could open from the interior of the car to inspect the condition of the tires. The inquisitive little simian opened the door and promptly freaked out. Flock was forced to make an unscheduled pit stop while running in second place to have the monkey removed from his car. He did manage to return to the track and finish third , once he got the monkey off his back. Having to make an unscheduled pit stop to remove a monkey is bad enough. Imagine having to pit to have one's son removed from the hood of the race car. During the June race at High Point, North Carolina Lee Petty dove into the pits for fresh tires. During the stop Lee's 15 year old son Richard ( yeah that guy) was given the task of cleaning the windshield. Lanky as he was Richard had to climb up on the hood of the Dodge to get all of the windshield. Unfortunately for him, no one told him the rest of the pit crew was done their jobs and next thing he knew Lee was charging back out onto the track, hollering for Richard to jump. Petrifie d Richard held onto the hood for dear life as his dad drove a lap of the track at full speed, and his father showed no signs of slowing down until he was black flagged by NASCAR. Richard may be the only pit crew member ever to receive a spanking for failing to complete his task on time. Poor Richard had a run in with some wildlife even more nasty then a frightened monkey early in his career. While racing at Savannah Speedway in July of 1963 Richard crashed his Plymouth through the wall of the speedway and wound up fifty yards out into a swamp. He exited the car and ran for safety, not out of fear of fire, but of a rather large alligator the locals called Jake who had eaten several pets of folks in the neighborhood around that time, and might very well have wished to add a Petty to his diet. Richard was not the only driver to go swimming after a wreck either. When the Daytona Speedway was constructed the earth for the high banks was excavated from the center of the property. The resultant hole was flooded and became Lake Lloyd, which exists to this day. During the first qualifier race for the 1960 Daytona 500 Tommy Irwin got in a wreck in his T Bird roared across the infield, up the dirt embankments around the lake and belly flopped his big Ford into the lake. He managed to swim to safety. Fortunately there are no alligators in Lake Lloyd. Tiger Tom Pistone was supposedly was so afraid of drowning in that lake that wore a life vest while racing at Daytona. Of course gators and monkeys aren't natures most dangerous creatures. An enraged and intoxicated mob of race fans can get pretty nasty too. During the race at the Asheville-Weaverville Speedway , August 13th, 1961 the track came apart to the point there were pot holes that Buck Baker later described as being "big enough to swallow a car whole". The red flag was thrown on lap 209 to allow the track crew to shovel busted up pavement back into the worst of the holes, and NASCAR quietly told the drivers that there would be 50 more laps and the race would be flagged. The drivers returned to the track and the NASCAR officials fled the track. Junior Johnson was flagged the winner on lap 258. But the fans in the stands decided they didn't think much of a 500 lap race being flagged short and a near riot broke out. They quickly blocked the only exit from the infield that the drivers and cars could leave by. As one fellow put it, he had paid five dollars to see a 500 lap race (yes race fans, 5 dollars bought a ticket in those days) and he either wanted to see the rest of the race or have half his money back. The drivers elected someone to go speak to the ringleaders of the mob. They picked him up and threw him in a nearby lake. Another fellow tried to sneak out by climbing a fence, was caught by the mob, beaten and tossed back over the fence. The local police were summoned, but quickly withdrew fearing for their own lives. The highway patrol tried to break up the mob but were sent packing as well. Finally one of Bud Moore's crewmen, Pop Eargle, a great big bear of a man, went to try to talk some sense into folks. One of the spectators had the poor taste to swing a two by four at Pop. Pop responded by grabbing the two by four and cracking the guy over the head with it. He stood there brandishing his weapon and asked who was next. At which point the crowd dispersed. Another drunk caused a near disaster at Pocono in June of 1993. A fellow who later admitted he had been drinking since the wee hours of the morning, t ook a dare from his friends he couldn't hop the infield fence, run across the track and touch the outside wall. Well as fast as cars are going at Pocono the intoxicated fan suddenly found himself in the middle of the track with Kyle Petty and Davey Allison barreling at him side by side. "Ever see a deer frozen in its tracks by headlights? That pretty much describes what that cat looked like." Petty later commented. "I never believed anyone could be that dumb." Allison added. Well, there's at least one close runner up. An equally intoxicated fan decided to go for a joy ride after finding the keys in a car at a Talladega race in 1986. Unfortunately the car he chose was the pace car and it was parked at the end of pit road. Einstein hopped in the car and began making hot laps of the track while the stunned crowd watched. Soon thereafter there was a host of Alabama State Troopers in pursuit. When they finally convinced the genius to pull over the troopers went Rodney King on him and gave him a good beating with their nightsticks on nationwide TV. Hey, guys, can't we all get along? Whoever you were, sir, this Buds for you!!! 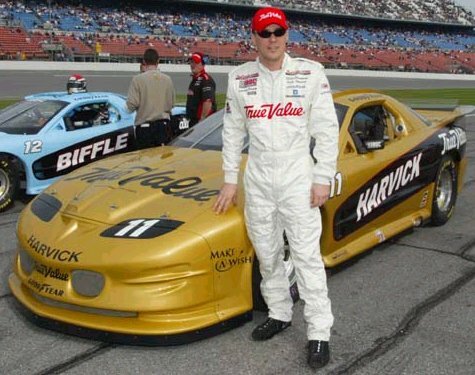 Kevin Harvick is a young driver striving to win races! He has many fans who are devoted to him and love to wear his clothes,dry off with his towel, even race his die-cast cars! If you are interested in viewing his merchandise, go ahead and Click here for Racing*USA There are a lot of things to be seen so go ahead and browse! I'm hopeing to add more links so come back again.